The class had to vote on a theme at the beginning of the semester and work for the first few weeks at designing a cake fitting that theme. 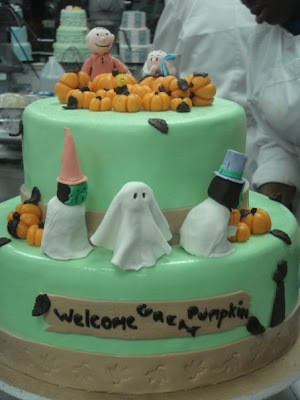 The class picked "Halloween" and the Chef said that he would be adding a twist later. After weeks of drawing up ideas, the class was given the twist. The cake would have to be 2 tiered and kid friendly. Well, out went the blood and gore and half of the classes' cake ideas. I was lucky both of my ideas were kid friendly and could be adapted to multiple tiers. Since the class is more about decorating then baking, the "cake" part was styrofoam. The first idea was to make each tier a different iconic Halloween figure's heads in a cartoon like manner. Such as one being Frankenstein's head, one as a mummy, one as a pumpkin and so on to the amount of tiers I needed. The second idea and the one I used was to make a "It's a Great Pumpkin Charlie Brown" themed cake. 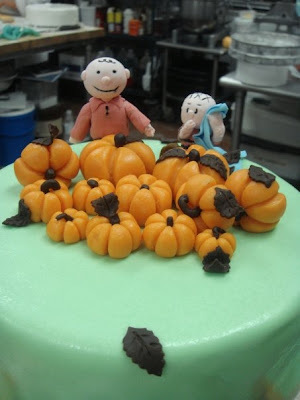 I started the figures and pumpkins about a week before we were to complete the cake in class. 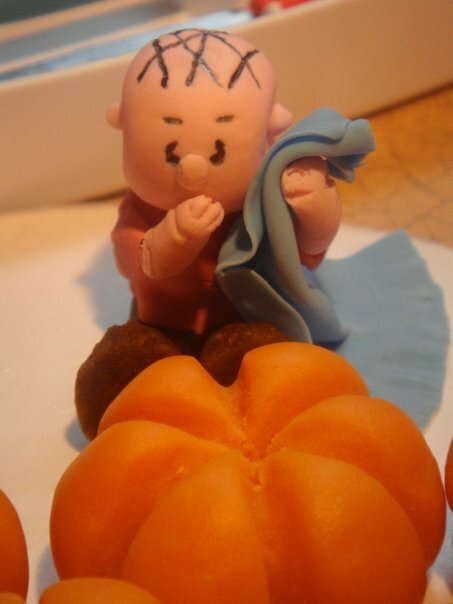 First, I made all of the pumpkins out of orange dyed marzipan. They were pretty easy to do. I just took different sized balls of marzipan and using a gum paste tool made the lines. I started the lines very shallow and worked them in deeper as I went along, so I could keep the round shape of the pumpkin. The stems on the pumpkins are little pieces of modeling chocolate. For the leaves on the pumpkins and around the cake I used the same modeling chocolate. I rolled it very thin and using a leaf shaped cutter I cut out the leaves. I then used a gum paste tool to make the veins in the leaves. I placed them how I wanted them on the pumpkins and allowed them to dry. I made the rest of the leaves for around the cake on the day the cake was put together so I could place them where I wanted them before they dried. Next step was to work on the characters. They were mostly make out of gum paste. Which if you've used it before, you know it dries very quickly. I used toothpicks to hold the different parts together. 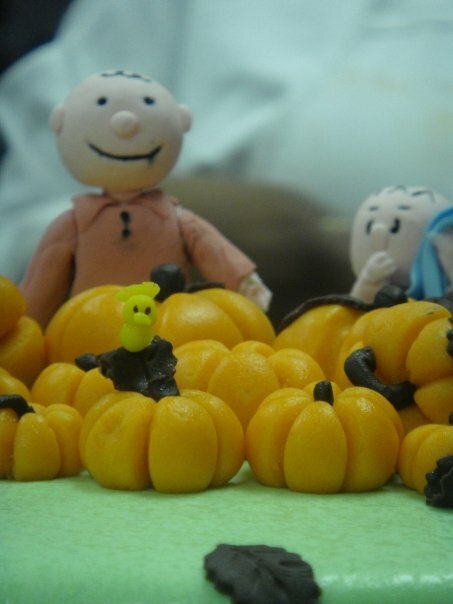 I used a toothpick and food coloring to do the faces and hair on Linus and Charlie. The ghost and other two figures were made out of modeling chocolate that was covered in white gum paste. Before the gum paste dried I cut out the eyes of the ghost with an knife. These characters where both fun and stressful to do. I am glad I worked on them over a few days so I could walk away when needed. 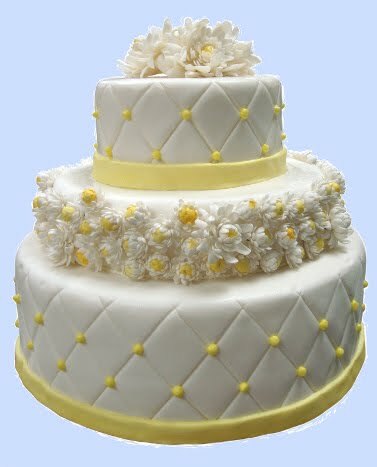 The cake was covered in a light green fondant and had a light brown border. I used a stamp to make the leaf pattern on the border. I used the same light brown fondant to make the sign welcoming the great pumpkin. I used a gum paste tool to make the lines on the sign to make it look like wood. The words were piped on in tempered chocolate. Here's a closeup of the sculpted figures on top of the cake, including a perfect little Woodstock! Here's a closeup of the bottom of the cake while it was being put together. And a closeup of the top of the cake while it was being put together. 1) Make sure you schedule out how much time you need to do everything and then add more. 2) Walk away from what you are doing if you get too frustrated. 3) Don't touch areas you painted on with food coloring on gum paste (It stays tacky and you will leave fingerprints and walk around with dyed fingers for a few days). 4) By doing things ahead of time you will greatly reduce the stress you will have on the day you are putting the cake together. Welcome to Confectionary Bliss, a blog created by Laurie and Dan Shapiro. After a few years in the corporate world, Laurie decided to turn her lifelong love of baking into a future career and graduated a year later with honors from the Philadelphia Art Institute. And after months of begging, Laurie finally agreed to put up this blog to showcase some of the amazing things she's done in the kitchen, just baking for friends and family. Confectionary Bliss will be updated periodically to showcase various desserts Laurie bakes in our home kitchen. We'll not only show the beautiful finished products, but we'll have pictures and insights from the entire creative process for some of Laurie's more complicated endeavours. Laurie will also share tips, suggestions, and ideas for anyone who wants to try their own hand at creating some confectionary bliss in their own kitchen. To make things easy for our readers, note that anything Laurie writes will be in blue, Laurie's lessons learned in green, and notes from Dan will be in black. Just as a teaser to show off the kind of cakes Laurie has made, here's her beautiful final project wedding cake from culinary school. Down the road, we'll have a few posts talking about the process that went into creating this beauty.